← News from Rusty aka Three Feathers! Timber was lost, but now he’s found! Yesterday I wrote about a sad call from Rusty, the mountain man. Rusty told me that Timber was lost somewhere around Loa, Utah, in early July. Many of my blog readers love dogs, and the news of Rusty losing his best pal touches them. Sympathetic comments pour in. Some readers put the internet to work looking for Timber. Reader “cinandjules” writes in the comments section that there’s a dog matching Timber’s description at www.findfido.com. I call the number at the site. 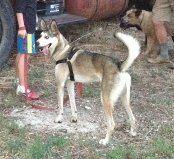 A woman named Daisy tells me her father found a husky mix while in Loa. Daisy says that the dog accompanied her father to California, and even Canada, before returning to their home. They named the dog Willy. I’m almost afraid to ask. I receive these photos with Daisy’s email. I call Rusty with the news he’s been praying to hear. I let Bridget and Spike out of their pen. We climb the hill at the back of the campground to pick up a cellphone signal. I call Rusty again, and he answers by bursting out with his happy news. I listen as he relays the conversation he just had with Jay, the man who found Timber and has been caring for him. Rusty’s talking fast with excitement. “Timber’s got double shots now. I gave him shots right before I lost him, and Jay gave him shots, too. I told him I’d come and get Timber, but my truck won’t make that trip.” Rusty says that Jay may be able to bring Timber to Flagstaff but it wouldn’t be until sometime in the fall when he might be in the area. He has to check on that. At one point Rusty interrupts our conversation. He’s hootin’ and hollerin’ and sending up “Thank you, Lord!” He isn’t aware of all the people who hoped and prayed on his behalf that Timber would be found. “Well, Rusty. Time for me to go. It’s so good to hear you happy again. Let me know any arrangements you make with Jay.” I don’t think Rusty’s fully listening to me. 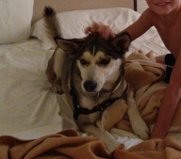 This entry was posted in Simple living and tagged Boulder, findfido, Flagstaff, found dog, Loa, lost dog, siberian husky. Bookmark the permalink. 90 Responses to Timber was lost, but now he’s found! What wonderful news!!! I wish I could drive out and deliver Timber to Rusty And my apologies to Rusty…I called him Ricky in my comments on yesterdays post. What a wonderful story with such a great happy ending!! Loved it! Awesome joyous end to a very sad event. So glad all the prayers were answered so quickly. Such wonderful news……….well done Sue for tracking him down!!! That is so cool! You made my day! Everybody loves happy endings! omg. I’m balling my eyes out here. That is SO wonderful! All I have to say is “Great job everyone”. Sue you sure are a special person and I hope I meet you one day. Rusty called me a few minutes ago again. He’s so happy he has to talk to somebody! There may be a way for Timber to get home in a week or so. We’ll have to wait and see. I’ll keep you posted. I’m enjoying the happy comments a lot more than the tearful ones! So are we!!! Thanks for the updates! All these nice people doing loving things sure balance out the terrible stuff some people do. Helps me keep the faith that people are intrinsically good! That is so cool. I wish I lived close enough to help. Yipee! I am so happy to read this!!! Wow, this is amazing. I want to say thank you too, to all the people who cared enough to help and to the wonderful people who took care of Timber these last few weeks and are willing to return him to his owner. Thank you most of all to you, Sue, for putting this on your blog. And a legend is born, with a cast of beautiful, wonderful and caring folks, that will be told around many a RV rally campfire. Love happy endings I agree Gayle with your comment above. SO thankful that TImber is being well taken care of and will soon be back home again!! When I read your story about Rusty and Timber being lost I felt so sad for both of them. But today, My eyes filled with tears to hear the good news. I am so happy to know they will be reunited. Everyone did such a great job. Its wonderful to know that there are kind, nice people out there. We can all go to bed tonight with a better feeling than last night. A man and his dog will be reunited.What a wonderful story and Rusty will always have RV Sue to thank for putting it on the internet.Wonderful job to all involved. Talk about tears! This is the best news ever… I am crying tears of joy for folks I will never meet – and wishing them all the best. By nature I am a glass half full kind of person- but this tops it all for good news and renewing ones faith that good people do still out number the rude and uncaring of the world. Thanks RVSue for your Blog and by default all the joy it brings in so many ways. Very happy for Rusty! I wish I could go get Timber for him myself! I can’t imagine losing my Trotters! Never give up hope! NEVER! I am so thankful to all of you for making this happen! cinandjules, for your detective work and Sue’s tenacity and everybody from everywhere bringing forth the positive energy and prayers made this happen! I think a lot of us will be having sweet dreams tonight of a gentle man and his faithful dog being reunited! What a wonderful story. Being a dog owner and lover, I can almost feel the sadness of loosing a dog and then finding him again. I am so happy for Rusty, and so thankful to all your readers for caring so much about someone who is suffering such a loss. It has to make everyone of your readers feel happy. Rusty seems like such a beautiful person to get to know. Can’t wait to hear about the reunion. This is the best news ever was! When I read your post yeaterday I was so sad, remembering my special, little boy Fabio (another Itailian Greyhound) who went missing from my daughter’s house while I was in the process of moving to Jackon, MS. This was 3 years ago and I still miss him every day. He was chipped. I’m sure he was found but no one turned him in to a vet. I couldn’t be happier for Rusty and Timber. What an adventure he has had. I can’t wait to see how he gets home. This is so exciting. I have a lot of connections in the dog show world. Please let me know if I need to contact any handlers in Boulder that may be heading to Utah for any reasons. Yay for Rusty & Timber!!! I appreciate your offer, TexCyn, and I’ll make a note of it. At this point, it’s wait-and-see whether any of our help is needed. OK, just let me know if needed. I’m happy he’s been found — what a story! But of course, we’ll all feel even better when they are reunited. I have worked a little with dog rescue and they are always arranging transport for dogs being adopted across the US. People will drive a segment, meet up with the next people, so on and so on. I bet we could get this worked out if we need to. I volunteered to transport dogs for an organization. It was fun meeting the dogs and seeing the reunions. After transporting five dogs at different times, I had to give it up because of the gas expense. OMG Sue, this is WONDERFUL. Talk about being in the fabric of someone’s life for a REASON! I’m so happy for you and Rusty and TIMBER. God Bless the family that found him and has kept him safe. It’s good to see there are GOOD PEOPLE all around us – and you’re one of them! Makes one wonder . . . What if I had been too afraid of camo man to say hello? What about the people I did pass by without making an effort to meet? You sure can’t judge a book by its cover…I’ll sure be reminded of that forever! It’s funny you say that. I was thinking the same thing Sue. I remember reading your first post of camo man, thinking you should be careful. Now you have become a instrumental part of his life. What a great story and lesson you have taught us all. I think this is absolutely fantastic!!!! This story has brought tears to my eyes – first of sadness that Timber was lost, then of joy that he has been found! The Internet is amazing, how total strangers read each other’s postings, then work together to solve problems and bring people and pets back together. This is awesome!!! I’m crying, too. What a wonderful answer to prayer!!!! So thrilled for Rusty and Timber! And God bless you and your readers for making it all come together!!!! I have this picture in my head of Rusty falling asleep with a smile on his face. Amazing, fabulous story. A tribute to the power of caring people! OMG!! That is just amazing !!! Goes to show how the internet and all the networking it provides can help out. Also, all the nice people along the way. I am so glad for Rusty !!! I couldn’t be happier that Timber is okay. I felt terrible after reading that he was missing, and thought how horrible it would be to know my Jack was out in the middle of a hostile environment all by himself. Incredible good fortune that he was found by wonderful people who took care of him. It’s a great ending to a story that might never had had an ending or a terrible ending. I’m sure Rusty will never let Timber out by himself in the middle of the night, again. Made me shudder to think of him–I couldn’t even respond. I just can’t imagine having to leave my dog behind. I see you have several leads on transport, but my grand niece works to rescue animals all over the country so she may have some advice should other plans fall through. Thank goodness for your blog, Sue. Hi, Julie! I’m going to camp around Sisters a bit, then go see the Pacific Coast, then come back over the mountains and head south to Klamath Falls on my way out of Oregon. I’m going to try to find your email address in my list of readers. As you know, I’m not the type for setting up social situations, but in your case, after all your invitations, I have to meet you! I am really looking forward to it! Shocking! That is So cool! The internet is an amazing way to get word out about almost anything. So glad to hear that Timber/Willy is OK and that Rusty will get him back, eventually. What an amazing and wonderful story! So glad your blog was able to facilitate such a happy ending! What a wonderful ending to the story….It would make a great book…..with your wonderful writing ability you would be a natural writing it!….many of the rescue organizations do weekly runs across the United States with dogs…please keep us updated…..I am so happy! Ok………It’s pouring rain here in IN this Monday morning……..(first time in a LONG time)…….and know I’m pouring more “water” in my office……….Lovin’ your Blog rvsueandcrew! You all have such huge hearts for other people………Love you all! I am so happy for Rusty and Timber.. Sue an amazing woman thank you – you sharing these stories and your blog has been an inspiration to us all.. There are amazing people out there and even reading the comments from others its like wow…… To Rusty and Timber so glad they will be back together, I am sure there are people out there that can make this reunion a go… Thanks again Sue for being Sue. Oh, what great news!!! I’ve stewed over this since I read that post. Live in Iowa, so too far to just ‘run Timber back’ to Rusty. But oh how I wish I could to see the looks on both their faces. By chance, does anyone know if Timber is microchipped? Can’t recall; too excited. And what a thought to ponder rvsue, about how many people we’ve passed by. Good example of how one person CAN make a difference. Way to go Sue. Sue. You’re just the best, most caring person. Thank you for telling us the story from the sad beginning to the end with such happy news. It shows us to never, never, never give up. God bless you, Sue, cinandjules, Timber/Willy’s temporary caretakers and Rusty. I had a feeling that your faithful blog friends would find a way to reconnect Timber and Three Feathers. Isn’t the internet great? How wonderful that the people who found him are taking good care of him until he’s returned home. Bless them, Daisy, and you, Sue, for relating the story. Nothing more left for me to say, it has ALL been said. A truly wonderful story, one that simply proves to me even more so that there are no such things as coincidence. For everything there is a time, a place. Every thing under the heavens… ALL in GOd’s plan for each and every one of us… All of His creatures. Amen… God Bless us all. This may be the best column in the BEST blog ever! Well, I can’t tell if I am crying or not as my eyes were already watering all the time, for a month now, eye infection or allergies???? I don’t know but hope to see a doctor this morning. I’d love to drop everything and go get the doggy and take him home but not sure yet when my job will end and guess I should not have a furry critter in my van either, but I’d sure do it if I could. More tears. Charlene! What an inspiration you are! And your blog is a delight. I looked at it a while back and then lost track of it in the shadows of my mind… ahem . . . Always a pleasure to see someone living life to the fullest Hope your eyes clear up soon. Stunning news! I was thinking about Rusty and his terrible loss this AM while having coffee. What a wonderful ending to the story. Sue — If you never do another good turn in your life (which I doubt), your spot in heaven is guaranteed by the efforts you put forth in helping Rusty. Ditto for the people who took him in, and are willing to give him back. What a wonderful story! Hello Renee! I’ve got a reserved sign on my campsite in heaven, but not from anything I ever did! Nice to hear from you… and thanks again for your thoughtfulness in offering me a ride back to the PTV on the day of our infamous rafting of the Madison River. Okay…now the task of trying to get Timber home. Let’s see……Delta Air Cargo? Nope probably too hot in Flagstaff and I would hate for anything to happen to Timber in transit. Shipping Wars? The lady Jennifer(in TX) deals with live animals…perhaps she would be interested? Fly to Denver….rent a car…pick up Timber in Boulder..drive 700 miles to see the reunion first hand…then fly home? That’s an option since we’re both retired. We are both retired cops who love animals….and the ability to track clues down is second nature. Don’t give up until there are absolutely no more options…when that time comes…think harder! If there is a will….there is a way! Keep us posted Sue, I know you will….. If she can help. Carolyn is very involved in these types of assistance. Keep us posted ….. What a great story! Wow! Isn’t that something! Hooray for all involved! OMG…you take the time to meet camo person; camo person takes the time to contact you out of needing to talk to someone and somehow you play a role in finding his dog! What a lesson about not being judgmental. This is a lovely, lovely story! Boy, it’s sure wonderful that Timber was found and will now be reunited with his Daddy. It breaks my heart everytime I hear an animal is missing. I worry because you never know where they are going and what’s out there that could harm them. My little girl Lily is a runner and I have to be very careful with her. She’s never off leash unless at our home or in her mobile fenced yard beside the trailer. Thank you for your comments regarding Rusty and Timber. It’s heartwarming to read your happy reactions to the news that Timber is found. Your offers of help are appreciated. At this time it is still not clear how Timber will be transported, as some things need to be worked out. I will let you know if your help is needed. Thanks again also for your kind words about me and my blog. My laptop needs charging which will take a while so I probably won’t be back online until tomorrow. I never thought this could happen……what a happy ending to a sad story. I’m a dog lover/owner, and would be so sad if I lost one of them. I am going to remember how helpful and kind people can be, when trouble comes. This is the best news, ever. I can hardly wait to hear about the reunion. WOO HOO…the best news I’ve heard in a while!! Thanks for posting this news Sue. Like the many others, all I can say is amazing! How lucky for Rusty to have met you and for Timber to have had two men care so totally for him. I feel sorry for the man who has to give him up but so happy for Rusty. I know first hand the joy he felt when he knew Timber was fine and that he would be reunited with him. Your blog definitely gets yet another GOLD STAR! I haven’t watched TV or listened to the radio or read the newspaper in quite some time now mostly because it is all bad news. I spend that time reading blogs which are in the main, happy and joyful and fun and interesting. But none more so than yours and few happier than this reunion you and your followers have made possible. GOLD STARS ALL AROUND!! This is just the most amazing story! I’m so happy to hear that Rusty and Timber are going to be reunited and how wonderful that you played a vital role in getting them back together. We need so much more good news like this in the world. I just close my eyes and think of the joyous reunion when they do get together….. all thanks to you! If you have not already found it Google Uship. It is a web site that lets you solicit bids to ship Timber. This would make a great human interest story on the news. Waiting to hear about the reunion is almost as bad as when we heard Timber was missing. Can’t wait for Rusty to have Timber back…I would be sick to death if my 4 legged babies were missing! Praying that it’s soon for Rusty! Very nice of the man who rescued him, and probably has become attached to him, to give him back. More than one hero in this story. It’s the story about Rusty & Timber and all the wonderful folks who brought the happy ending to their saga. What a true inspriation this story is and how it does restore one’s faith in the kindness of our fellow man/woman. I look forward to reading more about Sue’s travels and chance encounters with others. RVsue, I am just catching up on all your adventures so I am a little late with this comment. Also, I normally just “lurk” as they say as I have a hard time coming up with things to say the dont sound, well, mundane. But I just had to say “bravo” to you and everyone who help reunite time and Rusty. It is doubly poinyant as my familes late Huskey/Shepherd mix was also named Timber. Plus, a big thank you to you Rvsue for writing about your adventures you are a real inspiration to me an I hope to retire and hit the road too some day. Hope we meet up sometime. I rescue greyhounds, and it’s nice to meet other people who love them!! I read Sue’s blog from the beginning, too. She’s an amazing woman, and quite an inspiration!! Bless you, the greyhounds, and Sue!! !